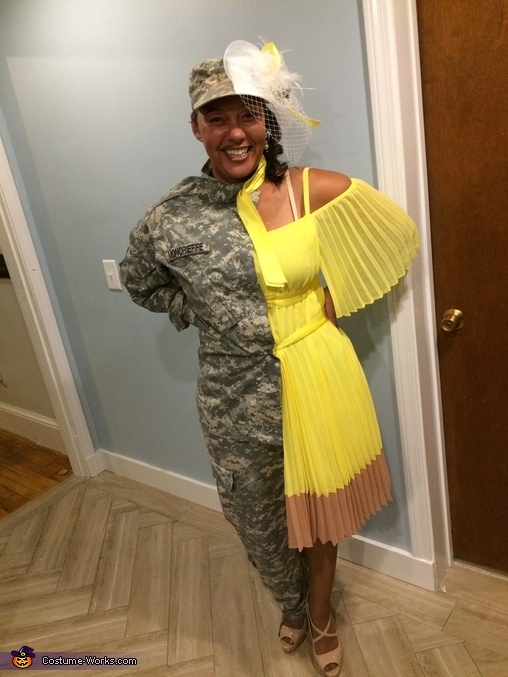 My husband is currently serving.I was invited to a Halloween party with some of our friends.What better way to bring him along then to dress up as “The Moncrieffe Family” I used half of one of his old uniforms and hunted for my yellow dress. The lady side is a nod to pinup girl/yellow ribbon in her hair.I am waiting for my Soldier yo return.So I recycled an old uniform and spent $17 on the dress and $2 on the white minihat with veil.The pants were cut into shorts on one side.I cut the dress and sewed the slip into shorts so the outer material stayed to one side.I also sewed buttons to the inside of the 1/2 jacket so that I could use ribbon I sewed to the back as a wrap around.A lot of tucking clipping taking off to modify and trying it on again and again.It took me a devoted week to hunt materials and make it.I did shop at a few thrift stores and fabric stores but so found the perfect dress at Burlington.I always make costumes for my son who is 18 now.I myself have not dressed up in over 20 years.This was by far my favorite costume ever.I hope you enjoy it too.Im trying for most creative or for individual but I really want to enter the couples or family category maybe next year.I am including a few pictures from the gal side ,the Soldier side and forward facing.I also met a lady at the party dressed as a tree. This was a fun picture.